Getting to know Silvia Kramska Think owning your own business takes grit? Multiply that by two, add the gruelling training demanded by fitness competitions and you have an idea of life for Silvia Kramska, founder of Open to Play clean protein and Real Food Organic Nutrition. A qualified nutritionist and strength and conditioning coach, Kramska shares her formula for keeping a balance amid apparent chaos.I have always been part of an active environment centred on wellness. I started to play tennis when I was five years old and continued to play professionally until I was 17. I lost my way health-wise for a while after that, so when I moved to Melbourne I promised myself that I would work in an area that truly makes me happy.My Open To Play protein business came about when I was prepping for my first fitness competition; I couldn’t find a clean, simple and healthy protein anywhere. Take melanoma, for instance. Elizabeth Aguilera has it and, according to her doctors, always will. Every two months she meets with a specialist to look for spots on her skin, have them tested, and determine whether to have another surgery. At the tender age of 24, she’s had four already, to remove seven cancerous patches of skin from her stomach 2, leg 3, and hip 2. Take anorexia–not a disease, but a disorder. Morgan Wehmer, Elizabeth’s sister, has wrestled that dietary demon and lived to tell. 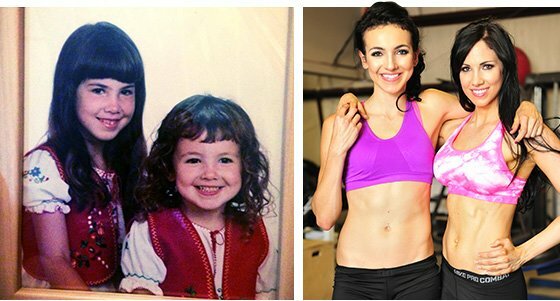 She was bullied in high school and took extreme dietary measures because she felt like it was the only thing she could control. Treatment and surgery are intense, and a body needs rest. Elizabeth strives to put in max effort in the weight room, but with regular treatment and surgery, she’s not always able to. She has to be careful, patient, and confident. Each day presents a challenge. Even before her diagnosis was delivered, Elizabeth was fit, but with her life in the balance, she has taken it to a new level. She took the stage in 2013–in part to mark a check on her bucket list–and finished fourth. But her doctors asked her to take a break in 2014. Her goal to turn pro remains unfulfilled. That bucket list was lengthy but the sisters have shortened it in the past six months. They worked as models and did photo shoots. Liz has asked photographers not to “edit out” her scars. She wants people to see them. They are markers of his past, and she wants people to know that cancer survivors can still be models. The bullying continued for years. Morgan tried to bury the jabs and insults, but their effects manifested in other ways. She and Elizabeth, tight as toddlers, grew apart as they fought through adolescence. When Morgan needed protecting, Liz had her back in the school hallways. When she wasn’t around, the taunts intensified. Anorexia Nervosa is an eating disorder characterized by a person’s intense fear of gaining weight or becoming fat. People who suffer from the disorder may practice unhealthy behaviors such as extreme calorie restriction, only eating specific foods, or skipping meals frequently. Treatment includes counseling, nutritional rehab and training, and various support therapies. She began to research nutrition and very slowly gained her weight back. It took two years, and it’s still an ongoing struggle. She wants more muscle. Morgan’s research produced some unplanned results. She fell in love with the study of nutrition and decided to pursue dietetics as a profession, before switching to another health-conscious field, nursing. To make matters worse, Elizabeth’s husband was deployed overseas as a member of the U.S. Navy. She graduated college during his absence and underwent treatment while he was stationed in Japan. Their separation further alienated the struggling older sister, but she had Morgan to lean on. It’s not that their roles reversed. Morgan didn’t become a “big sister.” They simply grew closer, and each time one faltered, the other offered support. Looking at Morgan now, it’s hard to tell that she was anorexic. If you don’t notice Elizabeth’s scars and ask her about it, you might not know that she has recurring skin cancer. Just imagine what all the other lifters are going through. How many battle confidence or body-image issues? Who is sick? Who is mentally ill? You can hide a lot of pain under your gym clothes. The distance between a healthy lifestyle and a debilitating one is not as great as you might think. A doctor’s diagnosis or a bully’s attack can change everything. To work on the items on their bucket list, the lifter sisters created a website, a Facebook page, and spread their message via social media. They use Twitter, Instagram, Facebook, BodySpace, and their website to reach people all over the globe, and not just to people with cancer or eating disorders. They’re out to help anyone who asks. Body Transformation: New Lifestyle, Smokin’ Body! Obesity distorted John’s reality. He lost 140 pounds in one year and developed an eating disorder to avoid going back. See how fitness helped him overcome adversity and find self-worth!